The risk register for 2017-2018 was formed on the basis of the register for 2016-2017, the analysis of external information, including the experience of the world's largest companies in the electric power industry, reports of consulting and insurance companies on the risks of companies in the fuel and energy complex and business in general, the report on the global risks of the World Economic Forum in Davos. It is ranged on probability of realization and influence on business of Society and given below on the Radar of risks. The radar displays a profile of risks of the Company for 2017-2018. Assessment of risks can be reconsidered further in connection with changes of factors of the external environment. All risks of Society are under close attention of management. The management plan strategic risks including as the existing control procedures regulated by the local normative documents existing in Society and the actions directed to improvement of business processes is annually formed. The system of scenarios and indicators of risks of business processes of Society and Group of RusHydro which monitoring allows to trace trends of risks is developed for assessment of effective management of risks in Society, and not just to fulfill already implemented losses. Scenarios reflect the sequence of actions, the phenomena which lead to realization of strategic risks. Set and character of scenarios for each risk is defined on a basis the riskoobrazuyushchikh of factors of the register of strategic risks of Society. issues of cooperation with shareholders of PJSC RusHydro. the failure to meet time constraints of performance of work resulting in unavailability of objects to commissioning. rise in price of flagman construction projects. The risk is critical due to the extensive regulation of the electricity and capacity market rules, high volatility of electricity prices at the Wholesale market for electricity and power, instability in fuel prices, decreasing solvency of counterparties due to the impact of the financial crisis, a decline in production, increased energy efficiency of consumers, adverse conditions (low water years), difficulties in forecasting load of the equipment. Conclusion of bilateral hedging agreements for the day-ahead market (including purchase of electricity as collateral for obligations). Conducting work to reduce receivables for the supply of electricity and capacity. growth of a share of the losses in proceeds from sales of power connected with short delivery of power owing to the compelled equipment downtimes. Critical risk of adverse changes/violations of law is noted as one of the most essential for the electric power industry not only in Russia, but worldwide. Regulatory requirements are constantly tightened on safety, insurance, environment, etc., energy efficiency of consumers is encouraged, and over time, the influence of this factor on the Company is likely to increase. The Company continuously monitors the initiated and changes in law and those under consideration, which in future may affect its activities, monitoring and revision of existing standards and regulations in the field of technical regulation. The representatives of PJSC RusHydro take part in major events and round tables on changing law conducted by legislative, executive and judicial bodies, public associations, professional legal associations and associations to represent their interests. The environment audits of affiliate branches are regularly basis. PJSC RusHydro takes part in the activities of the working groups of the Ministry of Energy of the Russian Federation on technical regulation (as concerns Technical Regulations) and the Technical Committee No. 330 of the Federal Agency on Technical Regulation and Metrology (as concerns national standards). additional accrual of the amount of the property tax by tax authorities. development of a control system of life cycle of the equipment of the operating hydroelectric power stations. the increase in volume of short delivery of power connected with the compelled equipment downtimes (all factors). In the conditions of the continuing stagflation and the international sanctions the risk slightly decreases in a red zone owing to revision of priorities of investment. At the same time restriction of access to proceeds of credit in case of long saving the international sanctions is possible. The most part influencing risk factors is made by factors, country and external for Group. For the Company the risk of emergence of deficiency of the means received from external sources on carrying out the planned investments is critical. He is closely interconnected with risks of implementation of projects of capital construction. Reduction of all or parts of the sources provided for financing of the investment program can lead to failure to meet time constraints of the projects realized by PJSC RusHydro or implementation of the scenario at which the Company will be forced to suspend construction or even to preserve a number of objects under construction of generation. Taking into account the high cost of works on preservation of objects of incomplete construction, in certain cases comparable to construction continuation cost, this fact will affect as economic efficiency of investment projects of the Company, and results of her financial and economic activity in general. Implementation the balanced model of working capital financing when both long-term and short-term sources of finance are used. work on preparation of zones of floodings of reservoirs of hydroelectric power stations under construction at the expense of means of the federal budget and budgets of territorial subjects of the Russian Federation. increase in the attracted credit resources, growth of loss of income, increase in losses in case of excess of the sum of loss of income more than a size which is subject to compensation within a tariff taking into account expected growth. Tightening of terms of an approval of key financial documents of Society and him TO. Long closing dates of contracts for performance of work (rendering services). Low financial stability and bankruptcy of contractors and suppliers. Low qualification of employees of contract organizations. Low labor discipline of contract organizations. Imperfection of system of monitoring of the course of realization of repairs and TPIR. Negative change of exchange rates (correlates with risk 1, 6 regarding management of currency risks). Adverse changes of the macroeconomic environment, including the crisis phenomena in world economy (correlates with risk 1). 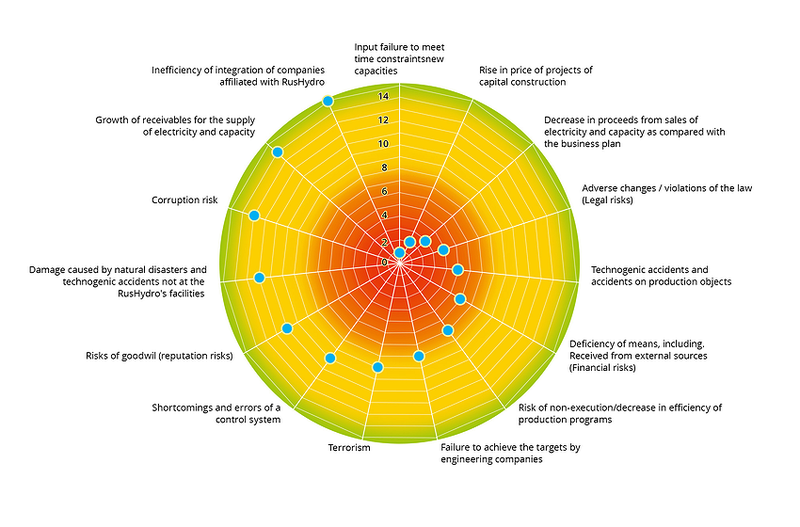 Lack of criteria of economic assessment of efficiency of innovative projects / decisions. Uncertainty/impossibility of assessment of efficiency of separate innovative projects / decisions (exogenous factor). World-class insufficient tracking of the advanced and innovative technologies. Actions on managements of this risk are similar to the actions realized in risks "Failure to meet time constraints of input of new capacities" "Deficiency of means, including received from external sources (Financial risks)"
The risk can influence essentially development of business of the company in general. In the conditions of crisis a key possibility of development is growth of quality and decrease in expenses within all stages of life cycle of assets of Group due to decrease in risks of engineering activity. At the same time are possible restriction of access of the engineering companies to proceeds of credit in case of long action of the international sanctions and difficulty with receiving means in hard currency. The company considers for itself essential this risk in view of possible decrease in an engineering part of business because of its insufficient efficiency and the high competition in the market. minimization of risks of poor control of non-core activity by means of her consolidation in specialized service subsidiaries. This risk is connected with the general tension in political and social spheres of the country, activity of bands in the North Caucasus and their attempts to move the activity to other regions of the Russian Federation, with high probability of emergence of local and regional armed conflicts, growth of threat from the international terrorism and level of political instability in a number of developing countries in connection with an economic crisis and also with activity of the radical organizations, development of industrial terrorism. In this regard PJSC RusHydro assumes emergence of the risks connected with the terrorist activity directed to hydropower objects including in the regions adjacent to border with Ukraine. Growth of cyberterrorist threats (at the moment Russia on the first place according to the rating of susceptibility to cyber-threats of Kaspersky Lab and other researches). Lack of coordination with the international anti-terrorist services in case of toughening of the international sanctions. carrying out audit is information - technical safety. Also armed security forces of objects are carried out by forces of divisions of private security of the Ministry of Internal Affairs of the Russian Federation and Federal State Unitary Enterprise Vedomstvennaya okhrana Ministry of Energy of the Russian Federation. Besides, plans of interaction with law enforcement agencies on protection of objects of the Company at commission or threat of commission of act of terrorism are developed. In the territory of objects of hydropower the throughput and intra object modes are entered. Together with law enforcement agencies actions for prevention of plunders will be organized. Also assessment of the most dangerous threats and development of plans of mitigation of consequences in common with service of civil defense and emergency of territorial subjects of the Russian Federation, in the location of the generating assets of the Company is made. For management of risk the Company develops the system of a regulation of activity and management of business processes, optimizes terms of carrying out and coordination of purchases, carries out interaction with interested persons. The division of internal control of PJSC RusHydro carries out the analysis of the main business processes for the purpose of improvement of the control system and increase in efficiency of processes. The civil liability of officials of the Company before the third parties is insured. PJSC RusHydro carries out introduction of corporate standards of management in again acquired or created subsidiaries and affiliates and also introduction of control systems of organizational projects, graderings of workers (gradering is a creation of system of official levels, taking into account the carried-out assessment of positions, strategy and corporate culture of the company), certifications of administrative personnel and implementation of individual development plans for workers. the unauthorized tolerance of the third parties on objects of Group of RusHydro. For the purpose of lowering of impact of this risk on the Company the actions directed to maintenance of image of Society in case of interaction with investment community are carried out, special events for media are held, publications in key all-Russian, regional and local media are initiated, information on the corporate website, in the corporate blog, community in "Live Journal, group in Facebook is regularly updated, on the regular basis monitoring of media is carried. The rating of risk without changes. The importance of risk is caused by uncertainty of consequences and complexity of forecasting of these risks. One of the marked most out risks for the energy industries companies according to insurance companies on the considered horizon. Improvement of procedures of protection, but also events of risk of the force majeur weather phenomena similar to a flood of 2013 are possible. There is a probability of emergence of accidents of system character and also receiving losses as a result of natural cataclysms. For ensuring system reliability in all power supply system at emergence of local accidents in the Company it is introduced and it is modernized according to modern requirements centralized system antiemergency automatic equipment. PJSC RusHydro observes the legislation of the Russian Federation in the field of industrial safety and uses the system of production control functioning on its basis. Risk events because of the conflicts of interests in case of reorganization (are possible including during privatization), at the same time the quality of management of risk constantly increases. Growth of probability of this risk in general in the world. Within improvement of system of control devices for decrease in corruption risks in the Company actions for suppression of illegal acts are implemented: the system of the complex automated control system of dissemination of information containing a trade secret takes root; it is controlled onto observance by employees of the Provision on insider information and also other measures are taken for impact on factors and consequences of corruption risks. The risk is essential to the Company. In the conditions of instability of fuel prices, decrease in solvency of contractors as a result of influence of financial crisis, lack of effective mechanisms of collecting debt, decline in production, bankruptcy of contractors and also in the conditions of the adverse macroeconomic environment the risk has grown. For decrease in negative impact of risk on the Company Actions for management of receivables in Society, including initiation of claim and claim work, carrying out calculations out of authorized credit institution of OREM according to DOP within the current activity according to the Provision on department on work in the wholesale market of the electric power and power and the analysis of the markets and Regulations of interaction between structural divisions of PJSC RusHydro concerning accounting of performance of obligations under the contracts connected with realization of electric energy and power are carried out.